See the movie trailer and poster for Danny Boyle’s drama, starring James Franco, Amber Tamblyn and Kate Mara. 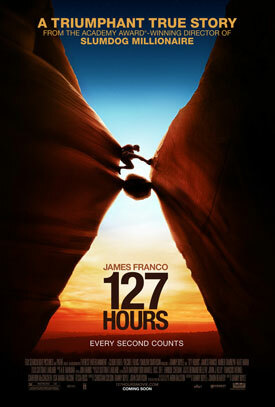 Watch the movie trailer for ‘127 Hours’. Based on the true story of mountain climber Aron Ralston’s (James Franco) remarkable adventure to save himself after a fallen boulder crashes on his arm and traps him in an isolated canyon in Utah. Running Time: 1 hr. 33 min. MPAA Rating: R for language and some disturbing violent content/bloody images.